“It was like living in two worlds,” said Muyi of being a Christian believer in the home of a shaman. Sicily is rich in ancient Greek ruins, and many say that they surpass in beauty those found in modern-day Greece. Muyi grew up a long way from Italy in the west African country of Nigeria. He came from a long line of shaman (witch doctors). His grandfather had been a shaman, his father was a shaman, and Muyi was in line to be the next shaman of his village. Shaman are very powerful people in their communities. Considered to have special access to the spirit world and ability to communicate with the dead, shaman are often contacted for healing, for protection against evil spirits, or for putting a curse on someone. Even though he had access to this power, somehow Muyi was not interested in following in his father’s footsteps. In addition to practicing shamanism, Muyi’s father was also a polygamist, with three wives. However, when his father took a third wife, Muyi’s mother—the first wife—left home and Muyi did not see her for more than eleven years. Receiving no love at home, Muyi lived the unsettled life of a hooligan and was often getting into trouble. One night, a Christian pastor approached Muyi. “What are you doing out at this time?” he asked. Muyi could sense the concern in the pastor’s voice and told him everything about what he was going through. Moved with compassion for the young man, the pastor longed to introduce him to a better way. He introduced Muyi to Jesus and invited him to visit his church. Muyi accepted the invitation and began attending the pastor’s church regularly—even becoming a choir member. Before long, he accepted Christ as his Savior. Although Muyi’s father was glad that his son was no longer living the life of a hooligan, he was not at all pleased that Muyi had become a Christian. “It was like living in two worlds,” said Muyi of being a Christian believer in the home of a shaman. Eventually, Muyi married a young woman named Giory (Gee-ory).Although he no longer lived in his father’s home, Muyi still received a lot of pressure to renounce his Christianity and join his family tradition of becoming a shaman. Nevertheless, Muyi would not give up his Christian faith. Not long after this, Muyi’s father died and Muyi and his wife moved to Libya, where Muyi worked in construction and furniture making. 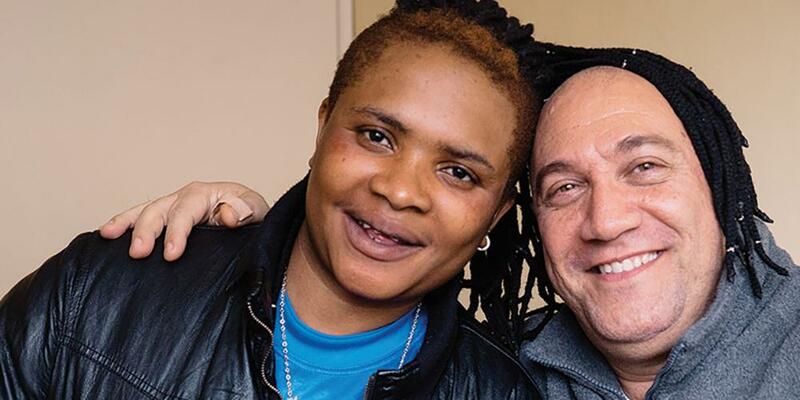 While there, Muyi became friends with two Libyan men who helped him and Giory, who was expecting their first child, move to Italy. The couple ended up in the city of Ragusa on the island of Sicily. Not long after arriving in Italy, their son, Joseph, was born. Muyi was able to get work in a furniture factory and for a few years all went well for the family. But then several workers at the factory were laid off, including Muyi, and the family again fell on hard times. One day, a teacher at Joseph’s primary school approached Muyi, telling him that there was a training school he could attend to learn new skills, including the Italian language. “At the completion of the coursework, you will receive a certificate and with those certificates it will be easier to get a job,” she told him. Muyi decided to enroll. The Italian language classes and practical work classes were being offered at the business place of Giorgio Bella, a Seventh-day Adventist who was seeking to minister to the needs of the community in Ragusa (see last week’s story, “Fully Engaged”). Muyi is grateful for the assistance given to him and is looking forward to putting his new skills to work. But even more importantly, his life has been positively changed through the love and care shown to him by the Seventh-day Adventists in Ragusa. This quarter, part of the Thirteenth Sabbath Offering will help to build a much needed church building in Ragusa, Italy. Please plan on giving generously. Thank you.